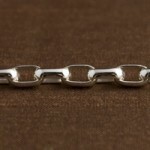 If you liked the Loopy in Love Necklace, here's the bracelet to match! Pendant is approximately 3/4" x 7/8" (a tiny bit smaller than a quarter) and 3/8" high at the height of the looped center. The fluid design is chunky in weight, but feminine in style. 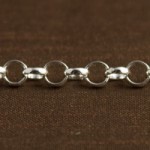 ROUND Rolo Bracelet (round links).